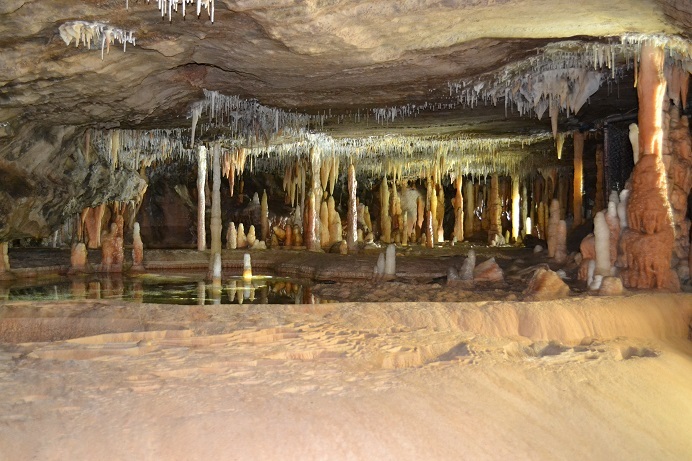 Buchan caves, located around 360km from the Melbourne CBD, will take nearly four hours to reach by car. Starting early morning is important, if you are not planning to stay overnight. The caves, famous for spectacular limestone formations are the handiwork of mother nature which took millions of years. The formations inside the cave are created by rain water slipping through cracks in the limestone deposits dissolving it and making a passage. The Royal and Fairy caves which have a length of nearly four kilometres were formed by underground water flows cutting through it. My plan was to start at five o clock in the morning and spend some time at the Lakes Entrance seaside resort and then drive to Buchan. Buchan is nearly 45Km from Lakes Entrance. Driving through the Monash Freeway to the South Eastern suburbs of Melbourne then passing through Yarragon, Traralgon, Maffra, Sale, Bairnsdale and Swan Reach. 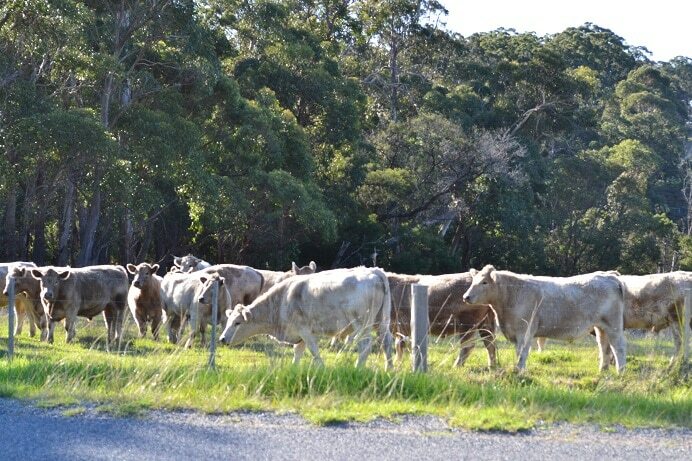 The route was an affirmation of the status of Australia as a farming nation. All the way along the road, there were many apple orchards, blueberry farms and cattle stations. Placards announcing the sale of Farm picked apples, blueberries and other farm produces were seen all along the road. But egg was the king; with many farms selling eggs at their front gate. 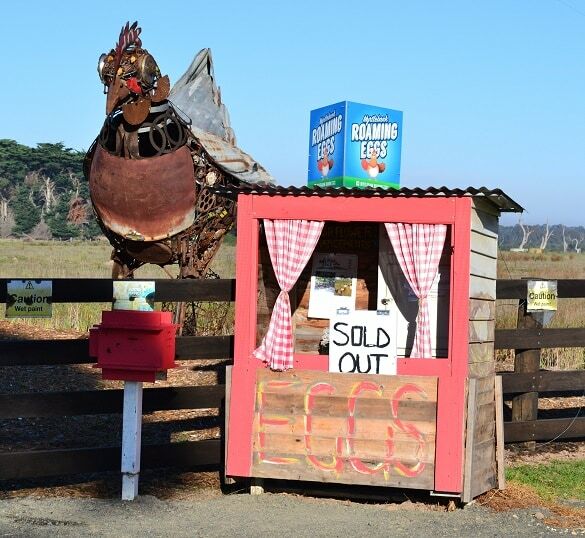 To my surprise there was even an Art Gallery selling farm fresh eggs. Melbourne weather forecast for the day was rainy but Buchan had a sunny day with a perfect 18 degrees. It seems, the nasty weather in Melbourne most probably forced many families to stay indoors. It looked as if the road was reserved exclusively for me, with no other vehicles at sight. This was a motivation was speeding. With a speed limit of 110, the empty roads nearly took the car to touch 180km/h. Soon my grand old man started puffing and panting and even smoking through the bonnet. The moral of the story is always check water and oil before heading for a long drive. It was not pleasant to wait another 45 minutes allowing the car to cool before pouring the water. Though speeding was not the issue here, never go beyond the speed limit unless you are willing to cope a rather large fine, demerit points, license suspension and probably a major accident with tragic consequences. When I reached near Maffra, I noticed some one waving for the car afar. A hitchhiker. That too an Indian. After all these years, this is the first time I am having an encounter with an Indian hitchhiker in Australia. A matter for celebration. I stopped the car. A man in his forties with fair complexion and a carry bag across his shoulders, was staring at me with his rather large eyes. “Good Morning, how are you?” I greeted him before opening my box of curious questions. “Jai Sree Ram”, he replied. Most probably an out of place Gosai – That was my first impression. “This is not the way to Sydney”, I said. Probably he is joking I thought. “We can go to Sydney from anywhere in Australia”. He said with a smiling face. The car moved. But without him. Definitely an out of place Gosai, I confirmed my observation. But later when I googled, I found myself wrong. This is also a route to Sydney, especially for caravan drivers who wish to visit beautiful scenic townships along the way. Passing through the Latrobe Valley, with its power stations and hospitals, comes Morwell and Traralgon, with the Gippsland hills proving to be a scenic feast for the eyes. After Rosedale comes Sale, which wants to claim its place as Gippsland’s first city. Melbourne’s urban spread is gradually swallowing once beautiful villages of farming communities. The ugly modern buildings are gracing this beautiful landscape. All along the way road works were going on for widening – an indication of increasing population. I reached Lakes Entrance by noon. 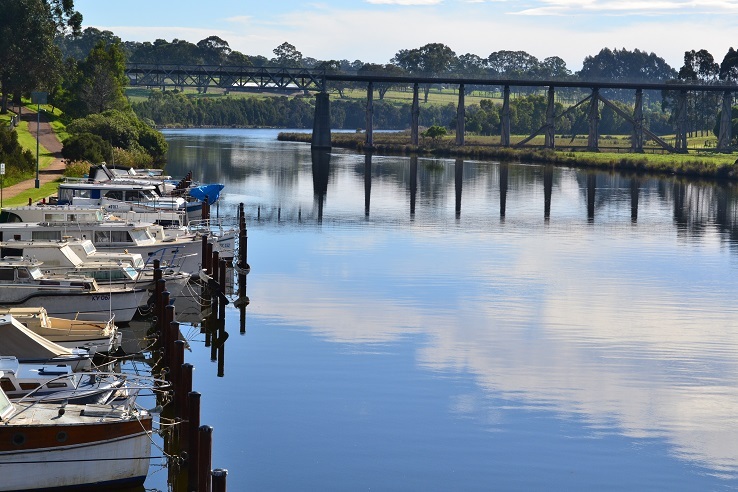 Lakes Entrance has an artificial channel connecting the Gippsland Lakes to the Bass Strait. That explains the name. This is a beautiful piece of land. There are three lookout points on the road to watch the spectacular views of The Entrance. But two of it can be accessed only from the other side of the road. 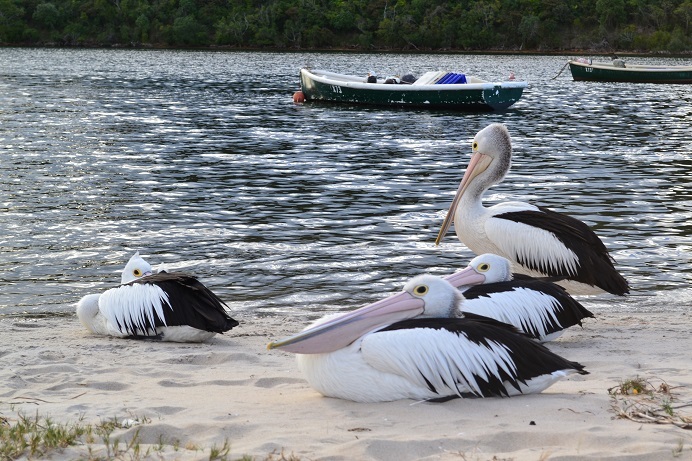 Lakes Entrance is a very popular spot for camping in caravan parks. 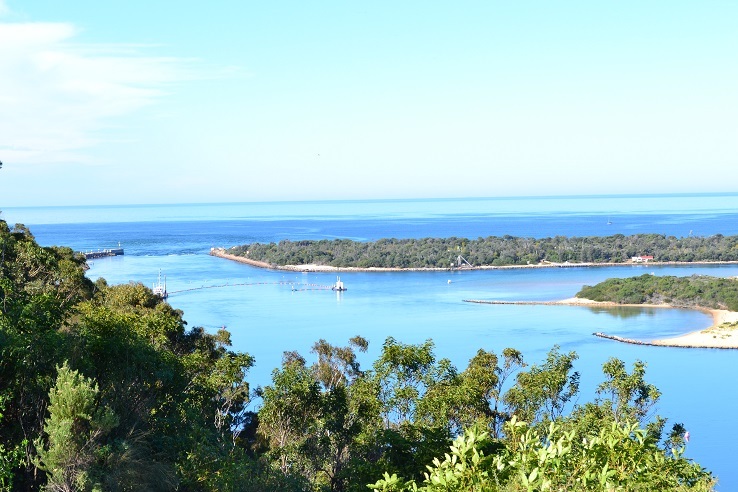 There was not enough time for me to cover Lakes Entrance and the activities like taking a Camel Safari or sailing. I headed straight to Buchan for the caves. Buchan is also blessed with a scenic landscape. The limestones from Buchan are used in some of Melbourne’s landmark buildings like the Royal Exhibition building and the War Memorial. Limestone is a sedimentary rock, composed mainly of skeletal fragments of marine organisms such as coral, forams and molluscs. Its major materials are the minerals calcite and aragonite, which are different crystal forms of calcium carbonate (CaCO3). (courtesy: Wikipedia) . Millions of years ago Australia was under the sea and that explains the presence of corals and other sea shells that help form the limestone beds. Most cave systems around the world are formed through limestone bedrock. This is a must see location for those who have never been to a limestone cave. It is different from anything you might have seen above the ground and is completely designed and created by the mother nature, which took millions of years. A big thanks to the man who discovered the fairy caves and shared the news with the world, Frank Moon, as a seven-year-old, discovered one of the caves but kept it a secret. Till he died at the age of 86, his life was associated with exploring caves and maintaining them. The Royal Cave was opened to public in November 1913 after an entrance tunnel have been driven from the surface and paths and hand rails had been installed. In 1929 an exit tunnel was constructed to avoid the need to retrace one’s steps. If we exclude the Aborigines, who had the knowledge of the existence of caves in the area, the first recorded exploration of caves in Buchan by European settlers were made by Stewart Ryrie on 7 April 1840. Since 1840, many explorations were undertaken to unearth the caves. There are more than 400 caves in the area. 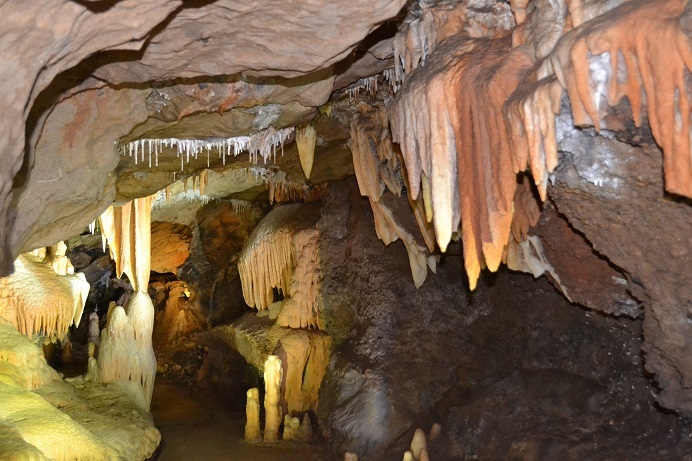 Royal Cave and Fairy cave are open to visitors, located at the caves reserve. I am not sure of the best time of the year to visit this place, but during autumn, the reserve and the surroundings create a spectacular display of colourful vegetation. The caves were beautiful and so was the picturesque villages on the way. It is getting late and I have to drive back to Melbourne another 4 hours through the barren roads and I have to cope heavy rain at least half the way as the forecast for Melbourne today is “Thunderstorm and heavy rain”.